There is no shortage of commentary on the Affordable Care Act, and no shortage of maps and charts to visualize all sorts of aspects of the U.S. health care system. But I recently came across this interactive tool, which I think is worth singling out. It comes from a company call Value Penguin, and despite the silly name they have put together a great visualization. You can spend lots of time exploring, zooming in on different regions, and playing with different scenarios. For example, go to your county, enter in your age and income, and see if you are eligible for a subsidy and what the cost might be for one kind of plan. 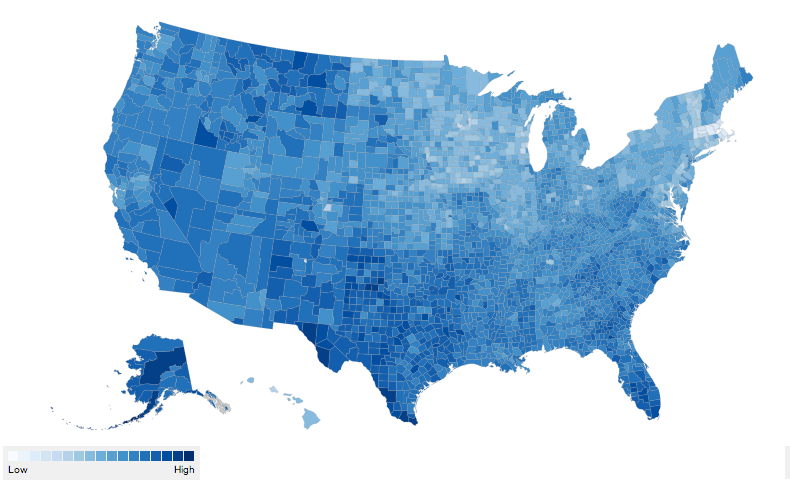 The map above shows the percentage of uninsured by county in the U.S. You can see that there are more uninsured in the south and west, and fewer in the north central and northeast. The uninsured rate varies greatly. Presidio County in Texas has an uninsured rate of over 37%, while in Norfolk County in Massachusetts only 3.1% are uninsured. 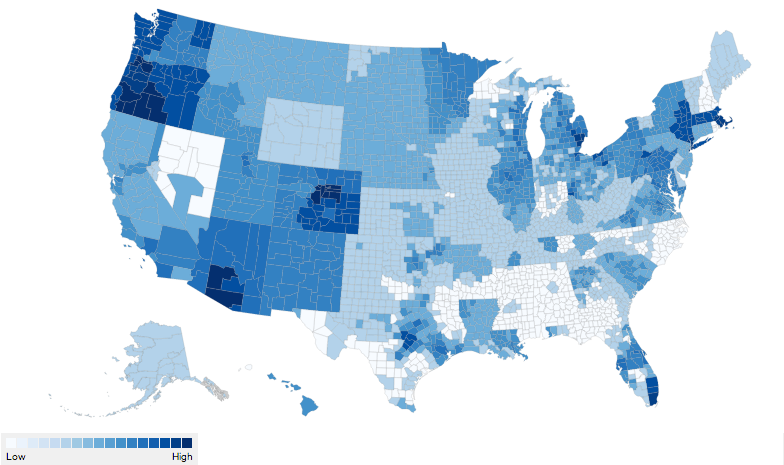 In fact, Massachusetts stands out as having extremely high rates of insurance coverage. They can thank the law signed by then-Governor Mitt Romney for that. Here we see a map of the number of companies offering insurance plans in the Affordable Care Act exchanges by marketplace. This also varies a lot. The Denver metro area has 10 companies offering plans, while most of Mississippi has just one. You would expect the number of plans to affect the price of insurance on the exchanges, since, all other things being equal, more companies competing on price would drive down the cost for consumers. And indeed this is somewhat apparent in the above map showing the price of a silver-tier plan in the exchanges by county. Look at southern Arizona for example. The counties that have more companies offering plans have lower costs than the surrounding counties. It would be instructive to view a scatter plot of plan cost versus number of companies, so see how strong this correlation really is. You can also see that there are many other factors impacting cost aside from the number of companies. Vermont stands out as having very high costs relative to the rest of the country, despite having an average number of companies. I would suspect that state-level insurance regulations play a role here. What other factors might impact the cost of plans?